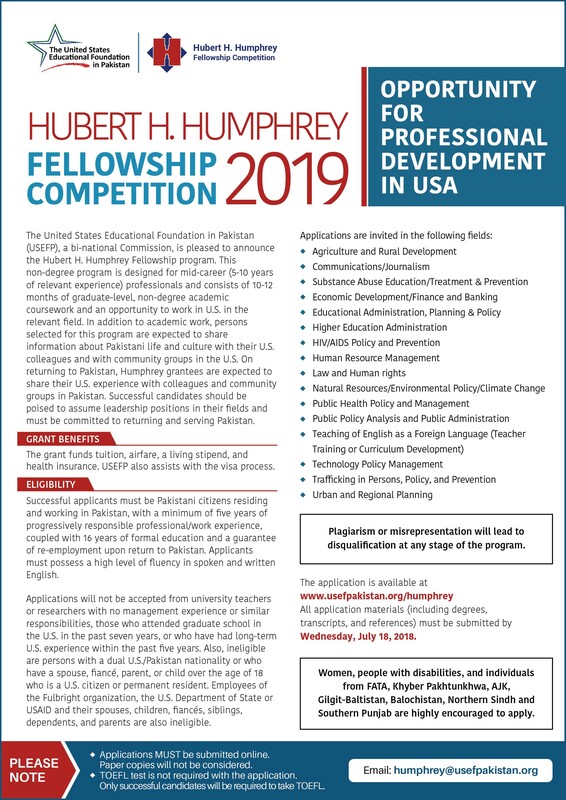 The Hubert H. Humphrey Fellowship Program brings accomplished mid-career professionals with demonstrated leadership potential to the United States for a year of graduate-level non-degree academic coursework and professional development activities. This ten month program consists of academic coursework and internship in a relevant professional organization. By providing future leaders and policy makers with experience in U.S society, culture, and professional fields, the program provides a basis for lasting, productive ties between Americans and their professional counter parts overseas. Approximately 18 campuses have been selected through a competitive process to host fellows in group with thematic and subject affinities. Each university is chosen based on institutional resources and the level of support and guidance it offers for academic and administrative support. Faculty advisers also assist Fellows in pursuing balanced academic and professional programs. All participants must return to Pakistan immediately following completion of their program. Successful applicants must be committed to serving Pakistan. They must be Pakistani citizens with a minimum of five years of progressively responsible professional/work experience, coupled with a Master's degree and a guarantee of re-employment upon return to Pakistan. Applicants must possess a high level of fluency in spoken and written English. Successful candidates should be poised to assume leadership positions in their field. Applications will not be accepted from university teachers or researchers with no management experience or similar responsibilities, those who attended graduate school in the U.S. in the last seven years or who have had long-term U.S. experience within the last five years. Also ineligible are persons with a dual U.S./Pakistan nationality or who have a spouse, fiancé, parent or child over the age of 18 who is a U.S. citizen or permanent resident. Employees of the Fulbright organization or the U.S. Department of State are also ineligible. What is included in the Humphrey Fellowship program? The grant funds tuition, airfare, textbooks, a living stipend, and health insurance. If I am selected when will I begin the fellowship program in the U.S? The finalists will depart in fall 2019. Can I submit the paper application? No, we only accept online applications. No paper applications will be accepted. Round 3: In-person interviews of short listed applications will take place in Islamabad between June – September. The interview panels are made up of both U.S. and Pakistani citizens. Round 4: Final candidates and alternates will be selected in October. Applicants who have become finalists or alternates will be notified by phone. Those who do not get selected will be notified by mail. Yes, Finalist will be required to submit a medical history and examination form, scanned copy of valid passport and No objection certificate (NOC) from employer / government of Pakistan. Can I defer my Humphrey award to the following academic year? If I decline Humphrey award, and reapply, will my application be given preference? Although you are welcome to apply again, your application will not be given preferential treatment. Fellows who wish to have family members join them during all or part of their fellowship must receive prior approval following a technical review of evidence that they have adequate personal funds to cover living expenses and dependent's health insurance and child care. Health insurance for dependents is required. Failure to provide adequate dependent health insurance coverage is grounds for terminating the grant award due to non-compliance with J-1 visa requirements. Dependents cannot accompany the fellows initially.